Well, I guess it's true. Winter is on its way. Somewhere. Here in North Texas, at the end of October, we are reaching the 90's. Classic Texas weather. Hot, then about 2 weeks of Fall in November and straight to Winter is usually about how it works around here. So it makes me really happy (and strangely confused) to start off the week with a high temperature expected at 91 degrees today and a Winter Release Peek for Verve! Teehee. I'm loving all the unusual color combos I'm seeing for the holidays so far. So when it came time to make this little card, I was thinking of some cute little girls' winter clothes some stores are trying to sell in this hot weather. Ha! The new set I've used is called Winter Mittens and it's so sweet! The mittens are colored with my Copics (I promise it matches better in real life--don't know what's going on with the picture) and I stamped the hearts (also included in the set) directly on the mittens in red to look like a little applique--just like something Audrie would wear. There are tons of new sets and several Plain Janes coming ya'll's way--can I just say--LOVE? That's what you'll think of them. Promise. All of them will be released this coming Friday, October 29th. Join us for the Verve Release Party over on SCS HERE Friday night at 9pm EST. For now though, ya'll can get your kicks by checking out what the other Divas have in store to spotlight for you on their blogs using this new Winter Mittens set and more! The Verve blog is what you'll want to be stalking all week for a list of the Divas and their blogs each day and Sneak Peeks galore. Starting with today!! SUSIE Q-TIP: This silver ribbon was a purchase I made a LOOONG time ago from Stampin' Up. I don't even know if they still carry it. I needed it for mass-producing my Christmas cards (which I no longer do--my list grew to over 70 people! ), and it has always been a favorite. It may be out of style. I look at it as "vintage". Get some and have fun. Fun colors on this winter goodie! Seriously, I love how you put the heart inside the mittens. How cute is that?! I love your card. It is so happy! your color combo is super cheery, and I love the heart stamped onto the mittens - adorable! Love your bright happy colors, and the hearts of the mittens - too fun! such vibrant colours - love those mittens! Gorgeous card!! I am really liking the non traditional colors. Thes little mittens are so adorable! A very happy and bright card! I know what you mean about the sweaters. It's hard to even look at them when you've got on shorts and a tee shirt! Love the bright, cheery colors and adore those mittens!! Love the color combo you used! So bright and cheerful! Just lovely, Susan! So bright and cheery! Oh I love the brightness of this card! It's really pretty. 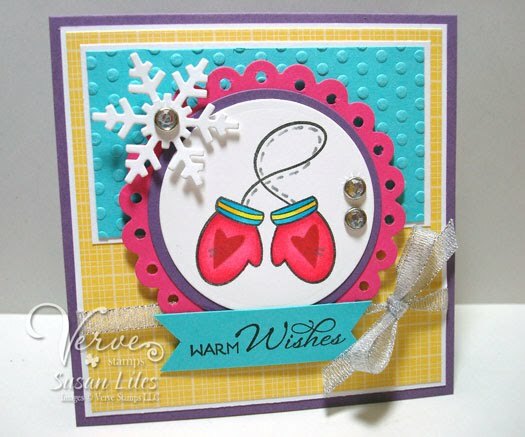 Love your use of different colors for a winter card...so fun, bright and cheerful! I love how you have used warm summery sunshine colours with your chilly weather mittens and your sentiment. Very nice card! Those mittens are adorable! What fun! I love the bright colors with those fabulous mittens. Can hardly wait to see more images this week! So cute! Makes me think of a southern holiday - as in way Caribbean! Beautiful job! I adore your fun color combo, Susan! Fantastic design! Yes, our 90 degree weather makes it hard to think about winter, but it helps when I see such an adorable card as yours! Love it! Great card for a Texas winter! I live in Wisconsin and it never feels that "warm" (LOL) but I love the combo and I'm sure my granddaughter would too. Thanks! Super cute! These bright colors make for such a fun card, and the mittens are adorable! The colors you used are wonderfully different!! So cheery for a dark winter day! Very cute card, I love the bright colors you used! I love the vibrant colors of your card, the snowflake and rhinestone are a nice touch. Love the bright colors! I also love how you decorated the mittens! How fun! Definitely a unique color combo. beautifully done, susan! love those bright and vivid colors and your layout...awesome sneak peek! Such fun and friendly colors! I love your used of those nesties! The bright colours are unexpected and so pretty! I love this mitten set! What pretty and bright colors. I love the bright happy colors you used in your card Susan (so nice to see YELLOW in a winter card!). I hope you and your family are feeling better. My thoughts and prayers continue to be with you. Just adorable. I'm in love with the mittens, way too cute! I have some of that ribbon. I keep pulling it out, and then putting it away again....LOL, yours looks so much better! So fun and sweet Susan!! Love the hearts on the mittens and the charming stitching!! Love your color combo, Sus!! What a fun color combination! I say use that "vintage" ribbon! Your cards always bring a smile. I love the happy colors you chose. Such fun color choices work well with these great stamps ! love it ! Love the bright colors & the hearts on the mittens are a great idea! I just love these sneak peeks. Your card is lovely. Great card Susan! I actually have some of that ribbon too! I love the bright, cheer, untraditional colors! The mittens and colors really do remind me of a little girl's winter sweater outfit! So cute! super sweet susie-q...I luv this fun wintery colorful card! How cheery! Wonderful fun colors. Wish our winter was like yours but alas the mountains here had snow this week already. Such a bright, cheerful card - love the mittens! Wonderfully colorful Susan! Love your style and super designs! Just perfect for the holidays! Too cute Susan! The colors are so fun and festive! Great job! I love your nontraditional Christmas/winter colors. The bright and cheery colors just made me smile! Super card. cute card! love the non-traditional color scheme! Love these winter mittens! Also like your bight festive colors! Great card! Love the colors!!! Great job on the sneak peek. Love all the layers! Love this bright and cheerful card Susan.......those hearts are too cute! Love the bright colors on your card.... stunning work! Cute and colorful mittens, what fun! This is a cool stamp set. Susan, I love the fun card you've created! It's so cute. The colour combo is really interesting. Very lovely! oooo, this is so fun. the colors are FAB!!! Hi Susan! Love the color combo of your card. And I have some of that silver ribbon. LOL!! Beautiful card. I just love those mittens and love your card. tfs. I love these bright colors! Cute mittens! What a super fun card, love the happy & bright color combo. Super cute card, love it! Nice color combo! I'm loving these mittens! Such fun colours. Pretty card. I just love the heart appliques on the mittens. Love how you've added your personal touch to the mittens by adding the hearts - great job! Love this bright little holiday card! So fun and festive! Love it! How colorful and cute! I love the mittens. Cute how you added the hearts on the mittens. LOVE the way you stamped the hearts in the mittens!!! HOW beautiful - and those colors are so bright and cheery and wonderous!!!! LOVE it! SO so CUTE Susie!! Different from everything I have seen and TOTALLY you!! What a gorgeous and cheerful color scheme for this wintery design! It feels a little tropical!!! So much fun! Just adorable, Susan! Can't wait to see the rest of the release! GORGEOUS! I love the color combo! So unexpected and cool! This is a really fun card. Thanks for sharing. I know what you mean about the weather...I'm a "west texas gal" and we've had mid-80's temperatures but it's still not the Fall weather that I wish for :0) Love your card! Very cheery winter colors and I like the heart stamped on the mittens. Cute little card. The atypical color combo makes for some nice variety. Love the fun, bold and bright colours you've used! A sunny card for a winter day! Just beautiful!